The cross-sectional area of longitudinal reinforcement, shall be not less than 0.8 percent nor more than 6 percent of the gross cross sectional area of the column. 1. The cross-sectional area of longitudinal reinforcement, shall be not less than 0.8 percent nor more than 6 percent of the gross cross sectional area of the column. NOTE - The use of 6 percent reinforcement may involve practical difficulties in placing and compacting of concrete; hence lower percentage is recommended. Where bars from the columns below have to be lapped with those in the column under consideration, the percentage of steel shall usually not exceed 4 percent. 3. In any column that has a larger cross-sectional area than that required to support the load, the minimum percentage of steel shall be based upon the area of concrete required to resist the direct stress and not upon the actual area. 4. The minimum number of longitudinal bars provided in a column shall be four in rectangular columns and six in circular columns. 6. A reinforced concrete column having helical reinforcement shall have at least six bars of longitudinal reinforcement within the helical reinforcement. 7. In a helically reinforced column, the longitudinal bars shall be in contact with the helical reinforcement and equidistant around its inner circumference. 8. 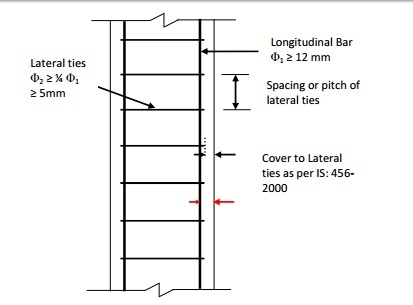 Spacing of longitudinal bars measured along the periphery of the column shall not exceed 300 mm. In case of pedestals in which the longitudinal reinforcement is not taken in account in strength calculations, nominal longitudinal reinforcement not less than 0.15 percent of the cross-sectional area shall be provided.